How Much Do Watch Winders Cost? Watch winders are the ideal way to keep your automatic watches wound. These devices simulate the watch being worn on your wrist, giving it the energy it needs. Read ahead to find out what you should take note of when purchasing a watch winder. Should it be battery or mains operated? What Should You Consider When Buying a Watch Winder? If you're interested in buying a watch winder, you should pay careful attention to the type of motor, as it plays a deciding role in the device's lifespan and noise level. High-quality watch winders feature motors with a ball-bearing construction, which differ from belt-driven motors. Motors with a ball-bearing construction save energy, last longer, and are quieter. A good watch winder turns in multiple directions, as not every automatic caliber can be wound in both directions. The rotor in the Valjoux 7750, the most well-known chronograph caliber in the world, is only wound in one direction. Watch winders with rotation intervals switch between rotating and pausing. Most movements require around 1,000 rotations a day before they're fully wound. While an automatic watch will not be damaged if it rotates more than 1,000 times in 24 hours, it is subject to additional wear. Furthermore, a watch winder requires more energy if it never pauses. Rotation intervals are very helpful when the winder is battery operated. The longer a battery can be used, the lower the number is that end up harming the environment. Large watches with a diameter of over 44 mm are no longer rarities. Since their weight increases with size, watch winder motors have to work even harder. Gold watches are also significantly heavier than stainless steel models, as gold is much denser. You can feel the difference when you hold a gold watch and a stainless steel watch in your hands. The types of watches you want to wind determine if you need a powerful, high-quality motor in your watch winder. Watch winders are available in different sizes, designs, and at different prices. They range from affordable entry-level models with space for one automatic watch to watch winding cabinets for professionals. You can compare prices and features in the following table. Watch winders in the upper price range are targeted towards professionals and collectors. If you have more than 20 watches from Rolex, Omega, Patek Philippe, or Audemars Piguet, then multiple watch winders or an entire display cabinet with built-in watch winders may be more suitable. Such cabinets are an appealing solution for jewelers and watch dealers. The Avanti 24 from the Austrian manufacturer Orbita has space for 24 watches. This winder, made of ebony, resembles a large glass-front cabinet. You should plan to spend around 30,000 euros on this winder. The Orbita Avanti is also available for 36 or 48 watches, costing 40,000 or 50,000 euros, respectively. If you don't have that many watches but still want an Avanti winder from Orbita, there are also variants with space for three, four, six, nine, 12, and 16 watches. The prices range between 2,500 euros for the smallest version and 14,000 euros for the 16-watch version. If you'd prefer another type of wood, then the Orbita Bergamo may appeal, which is available in rosewood, mahogany, or root wood. New, the Orbita Bergamo 40 costs over 50,000 euros. Watch winders from Orbita feature ball-bearing construction and solid-state controls, ensuring maintenance-free and long-lasting performance. The Austrian company Buben & Zörweg also offer luxury-class watch winders. The Revolution 8 has space for eight automatic watches and, like its name suggests, features a revolutionary design. The Revolution 8 isn't a box in the usual sense. Instead, Buben & Zörweg used a design with rounded corners and a lockable flip front cover with a crystal glass window. The Revolution 8 has an aluminum chassis and the inlay work is either done in precious wood, crocodile leather, or carbon. Polished piano lacquer gives an even more refined look to the carbon and precious wood versions. The interior is made of fine Italian nappa leather. An extremely quiet and long-lasting motor powers the Revolution 8. It works so efficiently that it can extend the life of the battery from 12 to 18 months. Its magnetic shield is also excellent. Magnetic fields can negatively influence the precision of your mechanical watches. Therefore, Buben & Zörweg reduced the electromagnetic radiation from their electric motors to an almost unmeasurable degree. Of course, the Revolution 8 offers different rotation programs and interval switches. It costs around 10,000 euros. High-quality watch winders are the ideal storage solution for your luxury watches. High-quality materials such as leather or rosewood coordinate well with wooden furniture and increase the value of these winders. The insides of many of these boxes are lined in satin. The individual watch holders in the winder are often made of leather and will securely hold your Rolex in place. Only the best motors are used as well: They're incredibly quiet and offer multiple rotation directions and intervals. The Optima Time Capsule is a unique futuristic watch winder from the British company Rapport. This cylindrical device has enough space for one wristwatch. The hinged door, which resembles a ship's porthole, has a magnifying glass to give you an even closer look at your timepiece. The design is reminiscent of a time machine. It has a chrome plate aluminum tube and you are given a good view of the brass cogs running inside. The Rapport Optima Time Capsule costs almost 2,000 euros. A classic watch winder is the leather Scatola del Tempo 3RT OS. As its name suggests, this winder has enough space for three watches. The winder is made of calfskin, the decorative stitching is done by hand, and the inner portion is made of leather and pure jacquard silk. The winder is both battery and mains operated and features 10 different rotation settings. You should plan on spending around 2,400 euros for this winder. An inexpensive watch winder costs around 100 euros and has enough space for one wristwatch. The Piccolo from Designhütte is in this price range and has three rotation settings: right, left, or alternating (right and left in rotation). The winder also has four speeds. The first rotates for 33 seconds, followed by a 12-minute pause. The second speed rotates for 10 minutes with a 90-minute pause. The third and fourth both have a three hour pause with a rotation time of 30 minutes and 60 minutes, respectively. The pauses help to save energy. The rotation times are sufficient to continually wind the movement. This device is mains operated. 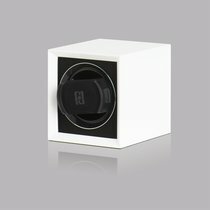 You can purchase a watch winder with space for two watches for around 200 euros, such as a glossy black watch winder from Rothenschild. A quiet belt drive powers this device and its sleek design blends seamlessly into a modern home. You can view the watches through the glass front. The device is either mains or battery (two AA) operated. Using batteries is practical if you're traveling or keeping the winder in a safe. New batteries last a month if the winder is continually in use. The device has three settings with alternating directions. You can select 900, 1,200, 1,800, or 2,300 rotations a day. Rothenschild also produces watch winders for four or more watches. These winders cost around 230 euros. Models with space for two watches on each carrier are exceptionally practical. In just four watch carriers you can fit up to eight automatic watches. This winder also offers four programs with different rotation directions. You can choose between 900, 1,200, 1,800, and 2,300 rotations per day. Some watch winders also have additional storage spaces for manual or quartz watches so you can keep all of your timepieces in one place. If you'd prefer to create your own watch winder, construction kits from well-established manufacturers such as MTE are available. One of the most curious DIY creations is a winder made from an old CD drive, an empty peanut can, and a rubber band. The rubber band functions as a belt drive and ensures the peanut can, where the watch is stored, continually rotates. A watch winder is a device that independently winds automatic watches, keeping them ready for use. Normally, an automatic watch stops working after a few days of not being worn. A watch winder prevents this by slowly turning the timepiece. These movements rotate the rotor and wind the spring, which provides the energy the watch needs. How Many Hours do Automatic Watch Power Reserves Last? Watch winders are particularly useful for watches with complications such as a perpetual calendar. If a watch with this complication stops running, then resetting the calendar can be very time consuming. However, even simple automatic watches with three hands and a date display benefit from a watch winder. Most mechanical movements have a power reserve lasting 40 hours, or less than two days. That's not enough to last the weekend. Thus, if you'd like to take your watch off Friday evening and put it back on Monday morning, you'll have to reset both the time and date. If you're a collector, a watch winder with space for multiple watches is a practical solution. If you have a mechanical, hand-wound watch, then a watch winder is of no use. A watch display case or watch box will protect and show off your favorite timepieces, though it won't wind the movement. Watch boxes are made of high-quality materials like leather or wood, and you are sure to find one to your liking.